It is hard to believe I haven’t inked this pretty stamp before now. 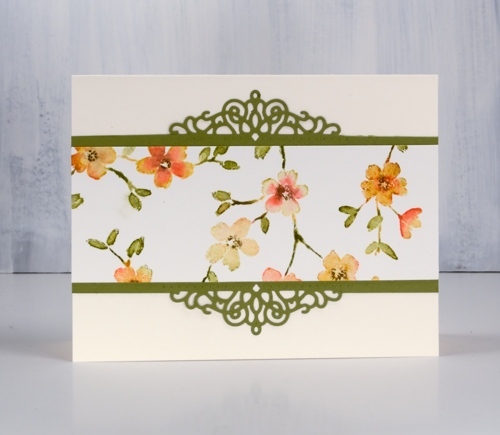 I made up for it by repeat stamping on a large panel to make into a set of cards. 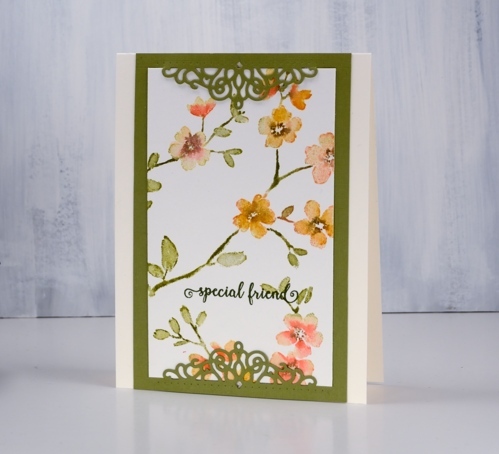 I put the 10″x 7″ hot pressed watercolour panel in my stamp positioning tool and ended up stamping PB ‘blissful blossoms’ four times. Each time I stamped I followed the same order. First I inked the whole stamp in scattered straw distress ink and dabbed some wild honey and abandoned coral ink here and there on the flowers, spritzed it with water. After stamping I cleaned the stamp, then inked all the stems and leaves in peeled paint ink, spritzed and stamped again. 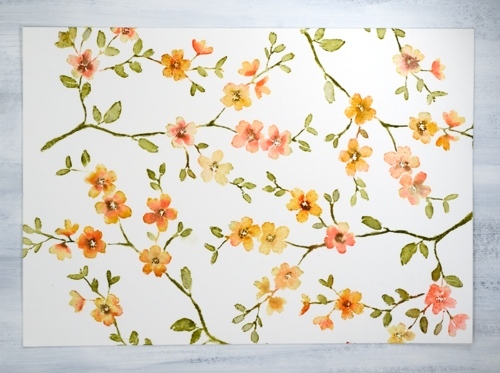 I kept partially inking with markers, spritzing and stamping until the flowers were well coloured. Before moving the panel and stamp to do another print I blended over the stamping with a paint brush and water. I repeated the process three more times to fill the panel. 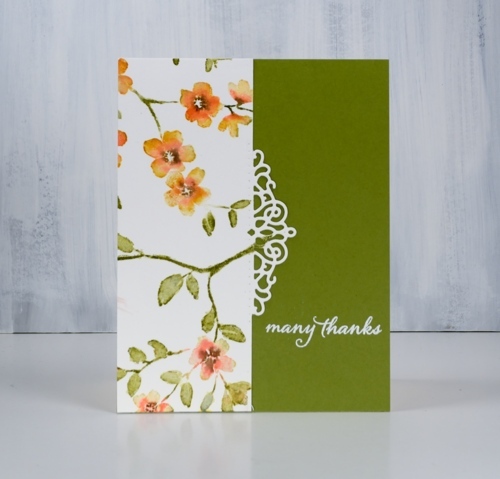 I was able to orient the stamp so the stems and flowers filled the space and looked like one big patterned panel. Once the panel was done I had to decide how to divide it for different designs. I could have done four of the same card but no, I wanted to come up with a few options. 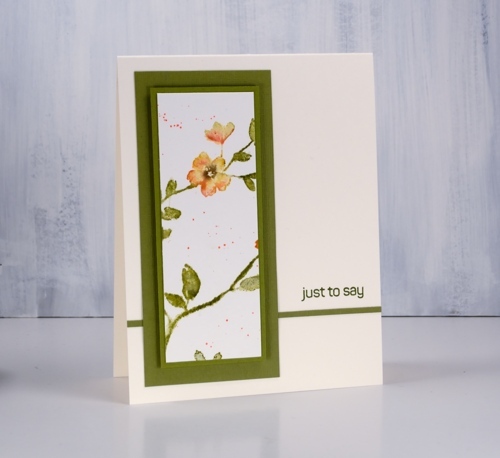 I pulled out a pretty PB die, a PB sentiment set and some green cardstock to create a set of five cards. The decorative die does not cut right across, it cuts out the scroll work but scores either side for folding. 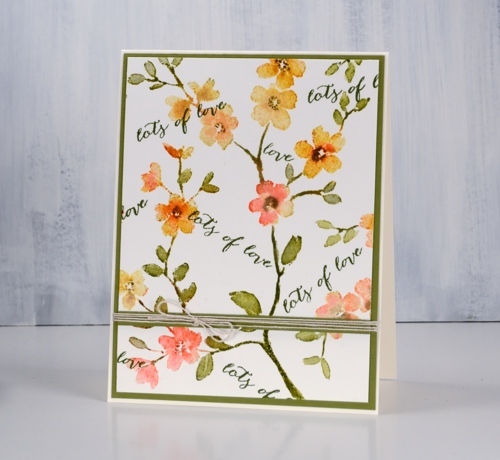 On several of the cards I cut on the score line for a border instead of a fold. By double matting and popping up the panel even the last scrap became a card. All the sentiments are from the handy dandy ‘happy snippets’ set.